The United States has yet to confirm that a top North Korean official is en route to Washington to discuss a second summit, with only hours to go before he lands. 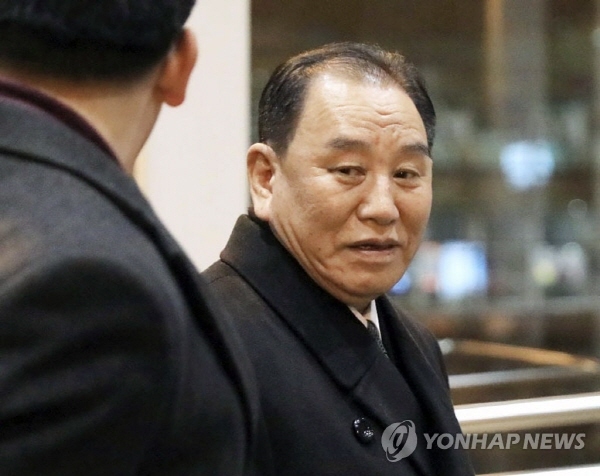 Kim Yong-chol, known as a close aide to North Korean leader Kim Jong-un, boarded a flight in Beijing on Thursday and is expected to arrive at Dulles International Airport near Washington at 6:50 p.m. While here, he would meet with U.S. Secretary of State Mike Pompeo, and depending on how that goes, pay a courtesy call on U.S. President Donald Trump to deliver a new letter from Kim, according to news reports. When asked if the State Department had plans to announce any meeting involving the visiting official, a spokesperson said, "We have no meetings to announce." But Stephen Biegun, the U.S. special representative for North Korea, was seen at the airport less than two hours before Kim's scheduled arrival. He told Yonhap he was expecting a flight at 6:44 p.m. but declined to give details. Pompeo's public schedule for the day was empty. And Trump, who has often taken to Twitter to announce North Korea-related news, has made no mention of the regime or its leader since he told reporters Jan. 6 that the venue of the second summit will probably be announced "in the not-too-distant future." "That means a lot," Ken Gause, a North Korea expert at CNA Corp., told Yonhap, referring to the absence of tweets. "If you look at how he tends to deal with foreign policy, this can suggest that the dialogue between North Korea and the U.S. has reached a sensitive period where nobody wants to upset the other side." A second summit would need to produce concrete results in terms of removing the threat of North Korea's nuclear weapons and granting the sanctions relief or other concessions the North seeks in return, many analysts agree. Trump and Kim's first meeting in Singapore in June yielded a vague agreement to "work toward complete denuclearization of the Korean Peninsula" in exchange for security guarantees from the U.S.
Gause attributed the Trump administration's ongoing silence to an undecided agenda for its meetings with the North Korean envoy. "There are fundamental problems that still exist that would have to be overcome if you're going to have a successful summit. It's obvious the two sides disagree on what denuclearization of the Korean Peninsula means," he said. The outcome of the North Korean official's visit will depend on what talking points he and Pompeo have been given by their respective chiefs, said Gause. The men will have "to see whether there's a possibility of progress on stickier issues, whether the U.S. is willing to make compromises on sanctions relief, and if they do, what North Korea is willing to do in return, probably something regarding Yongbyon or Sohae," he said, referring to North Korea's main nuclear facility and missile testing site.